This September, Dering Hall hosted a discussion involving some experienced High Point Market Authority (HPMA) superstars: 2017 Style Spotters Krista Nye Nicholas and Tami Ramsay (Partners and Principals of CLOTH & KIND), 2018 Style Spotter "Emeritus" Michelle Jennings Wiebe (President of Studio M and ASID Professional Member) and High Point’s Director of Marketing and Communications Ashley Grigg. 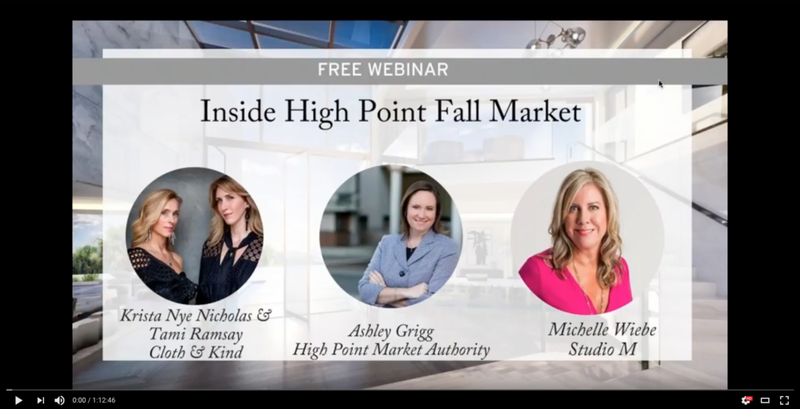 In this webinar, they provide insights, offered suggestions and answered questions on all things High Point Fall Market. 3. View the webinar video to check out a special first look into the High Point Field Guide which breaks down Market into eight different neighborhoods, highlighting major buildings and a few fun spots. 4. The MyMarket tool allows you to customize your Market schedule, find exhibitors, select educational and social events, and save all of your selections to your personal itinerary. You can download the MyMarket App to your mobile devices – Available for iPhone & Android. 2. Pro Tip: If you’re an interior design or new to High Point, spend some time at Hamilton Wrenn. Antique & Design Center AND 214 Modern Vintage – The Antique & Design Center is amongst the first stops for every leading designer and cutting edge retailer that visits Market. Also on the list (tied) is 214 Modern Vintage who are opening their NEW location this Market at 314 W. Russell Avenue. Pro Tip: Both of these places open early and those in-the-know arrive at market early to scoop up all the amazing one of a kind deals! Hickory Chair – Always a first stop for Krista & Tami as they can never ever wait to see what fresh and funky pieces Susan Hable, along with a stable of some of the most respected designers in the country, have dreamed up for this fully top notch 107 year old furniture company. Pro Tip: Make an appointment before heading over. Visual Comfort – Kelly Wearstler, Thomas O’Brien, Ralph Lauren, Aerin Lauder, Suzanne Kasler… need we say more? Visual Comfort, the original to-the-trade sister company to Circa Lighting is where you need to be shopping lighting for all of your projects. Highland House Furniture – Nothing says graceful quite like Highland House Furniture. It’s classic, but fresh. Timeless, but current. And having the likes of Barrie Benson and Randy and Courtney Tilinkski (aka Mr. and Mrs. Bungalow) designing capsule collections for them doesn’t hurt one bit! Cisco Brothers – Off the beaten path, and well worth the trip! Cisco Brothers is a family owned company and is unequivocally known for building furniture that is healthy for people and healthy for the environment. Krista Nye Nicholas and Tami Ramsay are partners and principals of nationally recognized residential and commercial interior design firm, CLOTH & KIND. Their collective aesthetic is influenced by their experiences traveling the world, interactions with other cultures, and the simplicity of their daily lives. In addition to being selected as 2017 Style Spotters for High Point Market, their work has also been featured in notable publications such as Architectural Digest, House Beautiful, Elle Décor, Traditional Home and many more. Tampa-based interior designer, Michelle Jennings Wiebe, is certainly no stranger to High Point Market – journeying to both the Fall and Spring markets over the past several years. As a veteran of the design industry, she is known for her influential style, business acumen and industry knowledge. Reprising her title as 2018 Style Spotter “Emeritus,” she will be leading the team, providing guidance to all members, and writing introductions for each style report. As Director of Marketing and Communications for the High Point Market Authority, Ashley Grigg is responsible for overseeing and managing all marketing communications. Ashley began working at HPMA in 2013, and has continued to grow within the company thanks to her team-oriented attitude, strong work ethic and ability to implement innovative solutions when needed. As the point person for all things marketing and communications, she works closely with departments such as the HPMA ad agency and PR firm as well as industry partners, design publications and third-party media companies. The High Point Market is the largest furnishings industry trade show in the world, bringing more than 75,000 people to High Point, North Carolina every six months.